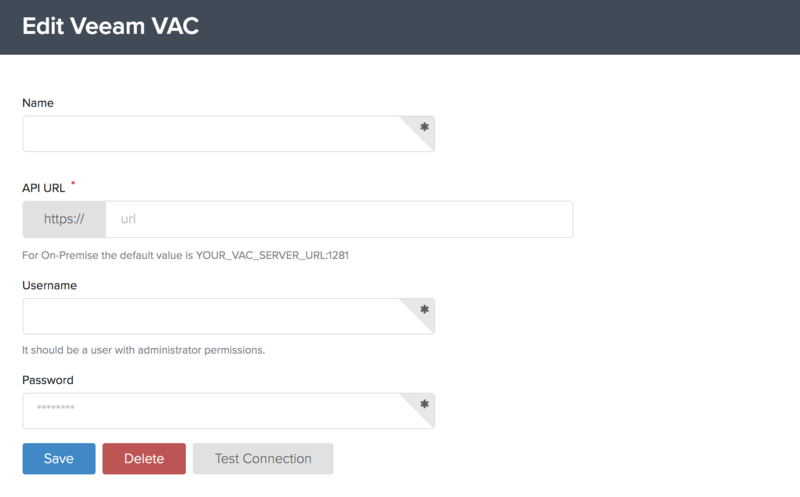 We now have a connection to the Veeam Availability Console (VAC) API as a featured integration within BrightGauge so you can create dashboards and reports. Here is a quick document to help you get set up with BrightGauge and Veeam VAC. We recommend (but do not require) that a separate, dedicated user is created for use in BrightGauge. A separate user will ensure the integration continues to function normally when individual user accounts are deactivated or edited. You now need to provide the URL, port, username and password for your Veeam admin account to provide BrightGauge a way to retrieve data on your behalf. Enter your Veeam Availability Console URL. For on-premise we need to be able access your network through port 1281. If you cannot access that from the outside (LAN), we will not be able to communicate. Enter the username and password for the account that will retrieve data. Again, we recommend (but do not require) that a separate, dedicated account be created for use with the BrightGauge integration. This should ensure the integration continues to function normally when normal user accounts are deactivated. If you see the Test succeeded banner message, click Save. Important Note: Be careful to verify that the username or password field inputs were not overwritten by a password manager with the wrong credentials after the Test connection step. If you have any trouble with authentication or have any other questions, please reach out to support. For additional information, please check out our support forums at support.brightgauge.com.